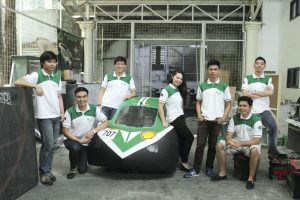 Following up on their second place run during the 2015 Shell Eco-Marathon held in Rizal Park Manila, The DLSU Eco Car Team is set to compete in the Driver’s World Championship (DWC) at the Queen Elizabeth Olympic Park in London. The team will be showcasing “Archer,” its entry in last year’s regional qualifier race at the Rizal Park in Manila. In last year’s qualifier, the Archer set the highest record in the Urban Concept-Battery Electric Category with a mileage of 78 km/kWh and placed second in the Petrol fuel subcategory after recording 159 km/l. The Archer itself will be a technology testbed for more advanced models and future energy efficient production cars. It sports a lightweight and aerodynamic design, an in-house developed motor controller, and is composed of carbon fiber and composite materials. To monitor the various subsystems of the car, the Eco Car Team developed its own android app dubbed “Archer-Board” for diagnostic and monitoring purposes. The app has the capability to measure the car’s speed, temperature, battery level, efficiency, and computer power consumption. The DWC is a gathering of the world’s best Urban Concept car teams that will compete on the basis of energy-efficiency and is an innovation competition that challenges students from universities from across the world to design, build, and race energy-efficient automobiles.